Mentorship is a hard path to walk. It is hard for the mentor and the protégé, for the mentor should not give easy answers, but use powerful questions to aid the protégé in critical thinking and holistic growth. This is where Paul takes the discourse on head coverings (1 Corinthians 11:2-16). He writers of the misogynistic tradition and beliefs surrounding who came from who (man from God, woman from man) and the dishonouring being covered or uncovered brings, but then he moves to the brilliant bridge portion for this is not the life and teachings of Brother Jesus who welcomed all as equals. Verse 12 puts out that all things are from God, and verse 13 places the judging within ourselves. Too often passages like this have been used to continue religious misogyny and oppression, by pointing out legalism. When in fact it is a philosophical tool of reflection that is reflect back the question, add some power questions and see what emerges from your own reason. As you walk through this part of the discourse, you see that the argument is missing the point for it does not matter about appearance, or rules. It is about the community being together in unity. An earth shattering norm; where each member has their own decision making autonomy. Yes it is becoming a catch phrase of these reflections, inherent worth just because that is how they are created. But in the following instructions I do not commend you, because when you come together it is not for the better but for the worse. 18 For, in the first place, when you come together as a church, I hear that there are divisions among you. And I believe it in part,[e] 19 for there must be factions among you in order that those who are genuine among you may be recognized. 20 When you come together, it is not the Lord’s supper that you eat. 21 For in eating, each one goes ahead with his own meal. One goes hungry, another gets drunk. 22 What! Do you not have houses to eat and drink in? Or do you despise the church of God and humiliate those who have nothing? What shall I say to you? Shall I commend you in this? No, I will not. 23 For I received from the Lord what I also delivered to you, that the Lord Jesus on the night when he was betrayed took bread, 24 and when he had given thanks, he broke it, and said, “This is my body, which is for[f]you. Do this in remembrance of me.”[g] 25 In the same way also he took the cup, after supper, saying, “This cup is the new covenant in my blood. Do this, as often as you drink it, in remembrance of me.” 26 For as often as you eat this bread and drink the cup, you proclaim the Lord’s death until he comes. 27 Whoever, therefore, eats the bread or drinks the cup of the Lord in an unworthy manner will be guilty concerning the body and blood of the Lord. 28 Let a person examine himself, then, and so eat of the bread and drink of the cup. 29 For anyone who eats and drinks without discerning the body eats and drinks judgment on himself. 30 That is why many of you are weak and ill, and some have died. [h] 31 But if we judged[i]ourselves truly, we would not be judged. 32 But when we are judged by the Lord, we are disciplined[j] so that we may not be condemned along with the world. 33 So then, my brothers,[k] when you come together to eat, wait for[l] one another— 34 if anyone is hungry, let him eat at home—so that when you come together it will not be for judgment. About the other things I will give directions when I come. It is not a communion meal, that is a shared meal within the community to ensure all are cared for spiritually and physically. What has it become? A divisive practice where cliques have emerged (think the Junior High Lunch room, where there are just some tables that are no gos). To add to the strife, there are people in the community starving, and no one cares they are letting it happen. This is a meal given to be done in mystical remembrance of Jesus of Nazareth. Communion is the highlight of worship and study together as a community, as the Body. What it has become is a grudge match. Instead of mysticism Communion has become a tool of exclusion for those that some view as unworthy. A meal of holiness now used for the people to continue the old ways of meal time; binge drinking and gluttony (remember it was Romans that invented the Vomitorium so they could continue gluttonous feasting). It is about honouring one another, for each is the imageo dei. It is caring for one another, loving of self and neighbour. Not allowing for a backsliding into the old comfortable ways, but living out loud the new path. Why is it so important to be a healthy community? To not be divided? Paul works into the realm of spiritual gifts, and how each gift works within the community like different aspects of the party. That is right; the community is a living breathing organism because it is made up of living breathing organisms. Now concerning[a] spiritual gifts,[b] brothers,[c] I do not want you to be uninformed. 2 You know that when you were pagans you were led astray to mute idols, however you were led. 3 Therefore I want you to understand that no one speaking in the Spirit of God ever says “Jesus is accursed!” and no one can say “Jesus is Lord” except in the Holy Spirit. Some will look upon the lists of spiritual gifts as the be all and end all for gifts. That is bullocks (1 Corinthians 12:12-34). These are but a few examples, for thinking of the multitude of things that are necessary for a society to bloom. Think and reflect on your skills and talents, what passions in you manifest as the best of you. You can tell when you have tapped into the spiritual gifts on your intrinsic being for they energize you to use, even if there may be weariness after use. They are also gifts seen by others, it can be the arts, medicine, science, philosophy, teaching, compassion, social work, child care, elder care, the list can go on and on. What are your gifts? What are the passions that the Holy Mystery has laid on your being? Will you live into and out of the greatest gift? It is interesting to take a different perspective to ancient stories and writings. Those who have read my fiction now I have dabbled in the concepts of Ancient Alien Theology and the idea of alien possession or hiding in human form. It is a concept that is not foreign to many religions and spiritualities. That is the concept of ghosts, demons and other supernatural beings, I myself have been involved in a few clearings of places and at least four remembered exorcisms. It is intriguing to reflect upon this, and wonder what if… what if these forces were not extra-natural, but extra-terrestrial? It is what happens as we move into the fifth discourse of Hebrews in the superiority of Jesus of Nazareth. The writer challenges the notion that the High Priest of the temple systems is the most powerful, and most holy (Hebrews 5:1-4) as appointed by others. A line of succession if the Torah is to be followed through the line of Aaron or the Tribes of Levites, and to be in the presence of the Elohim, there is ritual of protections taken. Just take a read through the texts around priestly attire and you have to wonder what these ancient materials were designed to protect against, the metals used, perhaps it was not a Glory of God, but a protection from cosmic radiation? The idea of tying a rope to pull a protected body out if they dropped dead as a means to protect the others from what killed. A super high priest selected by the Elohim, not bound by the customs of protection and rites of priestly duties. Is it because he was half-Elohim? That is a half-breed, half human/half-alien (a Mr. Spock of the ancient world?). Drawing close to show this, the writer brings us back to the blessing of Abram by the Highest earthly priest, Melchizedek, who was the King of Salem (Hebrews 7), and how did he bless? Wine and bread. Sound familiar? The blessing for Abram to come into full relationship with the Elohim was through wine and bread, the full new community of equality being brought about on Earth, an attempt of transfiguration by the Elohim is through a Halfling that uses bread and wine to remember. About this we have much to say, and it is hard to explain, since you have become dull of hearing. 12 For though by this time you ought to be teachers, you need someone to teach you again the basic principles of the oracles of God. You need milk, not solid food, 13 for everyone who lives on milk is unskilled in the word of righteousness, since he is a child.14 But solid food is for the mature, for those who have their powers of discernment trained by constant practice to distinguish good from evil. Remember that you have been on this journey awhile. It is not meant to continue at the level of pablum and breast milk like an unweaned babe, rather you are to move onto solid foods. Connect with the tough questions, the roots. Remember what the story is. Move forward in a way that challenges the norm, that shakes the foundations of oppression. Challenge what the usual is. Be not ususal (Hebrews 6). Live the journey that is strange, can be hard, but in the end do what is right, just. Seek justice. Seek equity and equality. Love freely. Spread hope. Embrace joy. Know peace. Deep dive into faith. Become one with the new high priest, of the new covenant. Know that you are loved, you are unique and you are special. Now the point in what we are saying is this: we have such a high priest, one who is seated at the right hand of the throne of the Majesty in heaven, 2 a minister in the holy places, in the true tent[a] that the Lord set up, not man. 3 For every high priest is appointed to offer gifts and sacrifices; thus it is necessary for this priest also to have something to offer. 4 Now if he were on earth, he would not be a priest at all, since there are priests who offer gifts according to the law. 5 They serve a copy and shadow of the heavenly things. For when Moses was about to erect the tent, he was instructed by God, saying, “See that you make everything according to the pattern that was shown you on the mountain.” 6 But as it is, Christ[b] has obtained a ministry that is as much more excellent than the old as the covenant he mediates is better, since it is enacted on better promises. 7 For if that first covenant had been faultless, there would have been no occasion to look for a second. A Gospel is a political declaration; in the Commonwealth nation such as Canada think of it as a speech from the Throne that opens our Parliament or Legislature, laying out the course ahead for the nation. Jesus of Nazareth’s followers had a gospel that was completely contrary to the Roman Emperor’s, in fact it was an act of treason to share and speak it. Now, the writer was pointing to the promise of a new Covenant of equality between Most High and the people. Covenant is a bond, promise, indenturing if you will between two parties. The Most High is pledging a new way in the life span development of the genetic experiment if you will. No longer an authoritarian parent was attempting to beat submission, or through parlour tricks winning approval. Rather, one of equity, justice and equality bonded in the transcendent love that Jesus of Nazareth’s birth, life, teachings, death, and return as a hologram guide (if we follow Ancient Alien Theology on this one- think the Doctor on Star Trek: Voyager). No longer a parent-child relationship that exists into late adolescence, but a more maturing of lifespan development where the parent becomes mentor-friend to the adult child in a health loving family unit. What is the new Covenant you are hearing in your heart? There are many ways to view holy texts. Some take a very literal-fundamentalist lens in which the black and white on the page is what was literally transmuted by the Holy Mystery. The human behind it being nothing more than a possessed teletype. It can also be looked as all allegory. It can be viewed as history, or anthropological-sociological texts. Fine literature is another way. No matter where we fall on the spectrum when it comes to reading sacred texts, what sets apart the skeptic with agenda, and the critical soul is the value they place in the stories. For that is what sacred texts are, humanity’s stories of wrestling with, experiencing, living and journeying with the Holy Mystery. O foolish Galatians! Who has bewitched you? It was before your eyes that Jesus Christ was publicly portrayed as crucified. 2 Let me ask you only this: Did you receive the Spirit by works of the law or by hearing with faith? 3 Are you so foolish? Having begun by the Spirit, are you now being perfected by[a] the flesh? 4 Did you suffer[b] so many things in vain—if indeed it was in vain? 5 Does he who supplies the Spirit to you and works miracles among you do so by works of the law, or by hearing with faith— 6 just as Abraham “believed God, and it was counted to him as righteousness”? It is one of the things many who have encountered me in ministry struggle with. Due to my progressive ways, and reads/explorations of the Hebrew Bible and Christian Testament many would want to class me as a heretic. Yet, one of the greatest gifts I have ever gotten at different points in my life is these stories. For, like any sacred text or story you hold as holy, each time you come back to it something new is enlightened. Much like Galatians. It is a writing of growth. For a psychologist, holistic, social or otherwise, Paul is writing to the gathering in Galatia about lifespan development. The moment when black and white laws fade more into the background as we grow and change in life. The laws (or rules) we have grown up with have shaped our internal moral compass. It has given us core values. Those values are what guide. Yes there are times when the laws and rules come into play. Usually when we succumb to the shadow, or let our gremlins-saboteur literally sabotage us as the old urban legends from the RAF went. Yet it is these values, the core Cosmic Christ that Paul reminds the following of. The values that were instilled at the beginning when the cosmic dust and holy breath crafted us. 10 For all who rely on works of the law are under a curse; for it is written, “Cursed be everyone who does not abide by all things written in the Book of the Law, and do them.” 11 Now it is evident that no one is justified before God by the law, for “The righteous shall live by faith.”[d]12 But the law is not of faith, rather “The one who does them shall live by them.” 13 Christ redeemed us from the curse of the law by becoming a curse for us—for it is written, “Cursed is everyone who is hanged on a tree”— 14 so that in Christ Jesus the blessing of Abraham might come to the Gentiles, so that we might receive the promised Spirit[e] through faith. In our growth as people, beliefs change. Sometimes they are shattered completely as Paul lays out here. The only way to move out of our identity politics, and ideological entrenchments is to be jarred. The life and death of Brother Jesus did that, as it turned on its head what was understood about being cursed and blessed. When has this happened in your life? That moment when what you believed to be true, was revealed to be a gremlin in your head? To give a human example, brothers:[f] even with a man-made covenant, no one annuls it or adds to it once it has been ratified. 16 Now the promises were made to Abraham and to his offspring. It does not say, “And to offsprings,” referring to many, but referring to one, “And to your offspring,” who is Christ. 17 This is what I mean: the law, which came 430 years afterward, does not annul a covenant previously ratified by God, so as to make the promise void. 18 For if the inheritance comes by the law, it no longer comes by promise; but God gave it to Abraham by a promise. 23 Now before faith came, we were held captive under the law, imprisoned until the coming faith would be revealed. 24 So then, the law was our guardian until Christ came, in order that we might be justified by faith. 25 But now that faith has come, we are no longer under a guardian, 26 for in Christ Jesus you are all sons of God, through faith.27 For as many of you as were baptized into Christ have put on Christ. 28 There is neither Jew nor Greek, there is neither slave[g] nor free, there is no male and female, for you are all one in Christ Jesus. 29 And if you are Christ’s, then you are Abraham’s offspring, heirs according to promise. There comes the point in life when you realize, and it is wisdom that brings you to this- not knowledge or age, that we are all part of the human family. There is inherent value just in the life. In that life is the promise of discovery of joys, loves, hopes, happiness, contentment, vocational purpose and the ability to positively impact our world through the simple acts of the Love Commandment. Loving the Divine that connects us, loving ourselves as our true self is, and loving our neighbour. Paul is writing about the growth of life. The journey from infancy to becoming a toddler to school age to adolescence to entering young adulthood and into adulthood. For that is what wrestling with the pilgrimage story is. That is the beauty and love within and for these writings I have. For that is what sacred texts are, humanity’s stories of wrestling with, experiencing, living and journeying with the Holy Mystery. 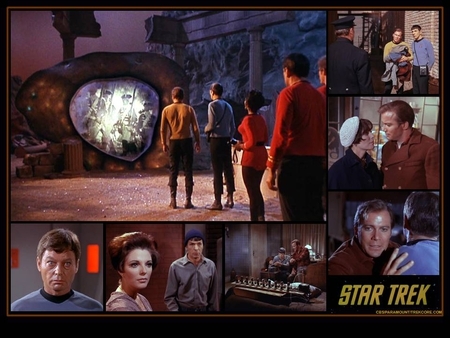 Star Trek: Gateways was a great book series that extrapolated and explored the portals first glimpsed on Season 1 28th episode, The City on the Edge of Forever. The Guardian of Forever is a time portal, and on an away mission a manic Dr. McCoy travels back to 1930’s New York. In true Star Trek fashion, he violates the Prime Directive and interferes by saving a woman’s life thus altering the course of history. People wonder why the Department of Temporal Investigation was needed? Too many Starfleet officers intentionally or unintentionally messing with time. Yet as they locate the right moment to find Dr. McCoy, Kirk and Spock enter into the socio-economics of 1930’s New York. The world of the Great Depression- soup kitchens, men hostels, work hard to come by (some may note it looks like the Catholic Worker’s Movement, or other such social gospel movements). Sadly, we have not moved much behind this reality. As we have many plans to reduce poverty, eliminate poverty that never seem to catch the right traction in our world. It is this prophetic voice that holds into the episode. As Edith Keller, the social worker making positive change in her community. This was the life saved the irrevocably altered history for nefarious purposes. To correct the timeline, the selfless angel needed to die. What do you do? Do you let the accident happen and a life making a difference be lost on the faith that it will re-set history? Or do you still allow Dr. McCoy to save her for the short term care? That is the crux of the faith argument, within the world, and within ourselves. A choice is made. In that choice, something is lost and something is gained. Authentic grief. Loss. Change. Care for neighbour. Advent is a time of waiting. Part of waiting is reflection and contemplation on the past year, as the new year started last Sunday. What choices of faith have you made? Which did you not choose? The question of faith, as Kirk, do you save Keller or let her be hit? Light or darkness this solstice season, sometimes it is not always clear which choice is which.